UPDATE: Last night, KHQ changed the title of their story to the more uncertain headline, "Has The 'Knockout Game' Made Its Way To Spokane County? Media outlets have been having a field day with the notion of the "Knockout Game," a contest in which a young person attempts to knock out a random vulnerable victim with a single sucker punch. The sense of panic is understandable. Random crime is scary, precisely because it’s random. So when three young adults randomly assaulted a stranger in Spokane Valley on a Saturday afternoon — with no apparent provocation or theft — sheriff’s deputies and media outlets drew parallels to nationwide reports of the game. In a short e-mail exchange with Spokane County Sheriff's Office Deputy Craig Chamberlin, I asked what evidence, if any, deputies had that this assault is part of the Knockout Game rather than it just being a random act of violence. And where some previous incidents supposedly linked to the game have been videotaped, at this point Chamberlin couldn’t say whether this assault was videotaped. In fact, this assault, where deputies report the victim was punched and kicked repeatedly in the face by all three assailants and then, once the victim fell to the ground, was kicked some more, seems to directly contradict the Knockout Game’s rules. The objective, by some interpretations, is to see if one person can knock out the victim with one punch, not to see if a group of teens can beat a person down with a flurry of punches and then keep beating them. And keep in mind, seemingly random assaults by young men against strangers have happened before in Spokane. The Delbert Belton case sparked national outrage months before the knockout game trend pieces, a seemingly random assault that resulted in waves of speculation before the facts were released. (In that case, Belton’s wallet was stolen.) A disabled homeless man was set on fire in downtown Spokane in 2006. Last year, KHQ reported on a teenager suspected of randomly murdering a woman with a sledgehammer. All brutal attacks, seemingly random. It’s generally a good idea to take media reports about scary kids-these-days trends with a grain of salt, especially if they rely on anecdotes instead of cold, hard data. Remember rainbow parties? Remember vodka-soaked tampons? Remember the choking game? Gawker has a helpful timeline of factually-suspect moral panics from years past. Just a few months ago, local media outlets were reporting about a “teenage crime wave” “spiraling out of control” downtown, despite the actual data showing that crime in the city core had decreased. 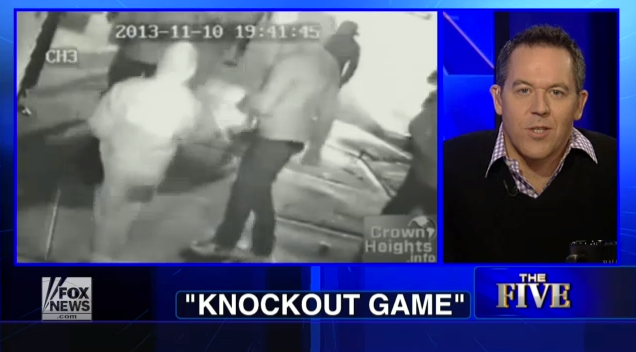 Incidentally, that incident – a seemingly random attack that began with a sucker punch – could have very easily have been lumped in with the Knockout Game hysteria, if Knockout Game trend pieces were being widely written then. Meanwhile, lots of national media outlets have been raising skepticism about the supposed trend. Does all this mean it’s impossible this random assault was inspired by the Knockout Game (or media trend pieces over the Knockout Game)? Not at all. But it doesn’t hurt to actually wait for the facts, instead of swan-diving headfirst into speculation.